I would say that most people have a favorite pillow. Imagine yours..It's the comfiest to sit on, it gets you to sleep at night, and its probably the best food tray you've ever used. And like most of our favorite things, it's immortal. Well, so we'd like to assume at least. 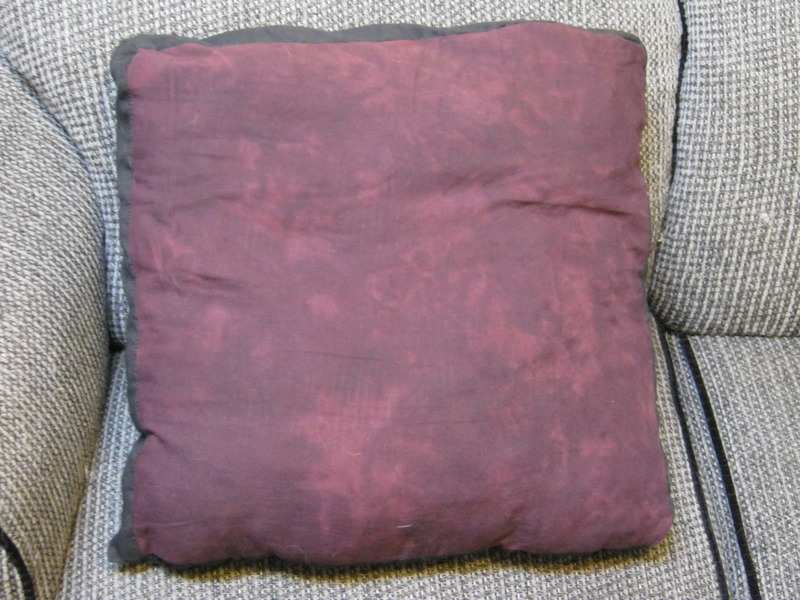 Unfortunately, years of wear and tear will eventually deteriorate any item you use every day, even old faithful pillows. So what happens then? 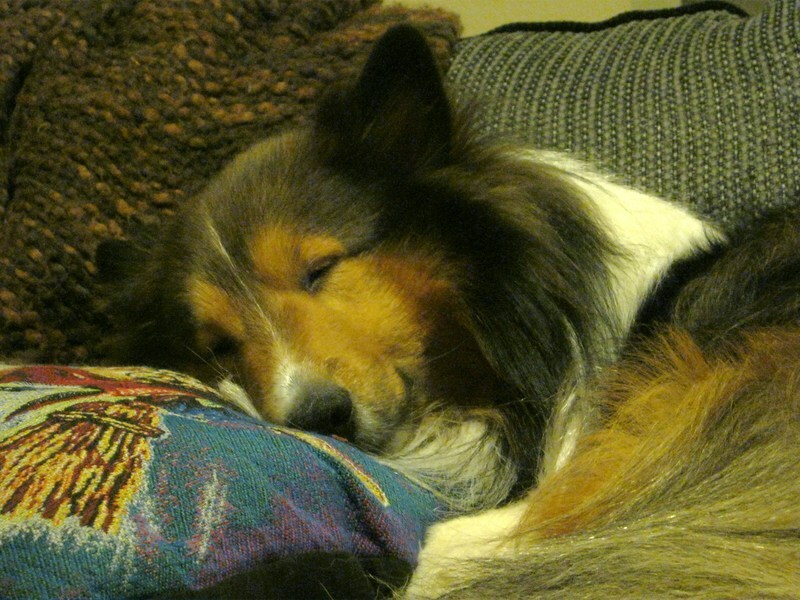 Do you dare throw out your tattered but uber comfy pillow? Don't do it! That would be a waste of a wonderful opportunity to give your loyal friend a brand new makeover. All you need is a seam ripper and a little bit of sewing magic and your pillow will keep kickin' for another 10 years or more. My mom inspired me to do this project when she pointed out that our living room pillow was in bad shape. And honestly, that was an understatement. Firstly, I must say it's the raddest of pillows..(Geek out time!) 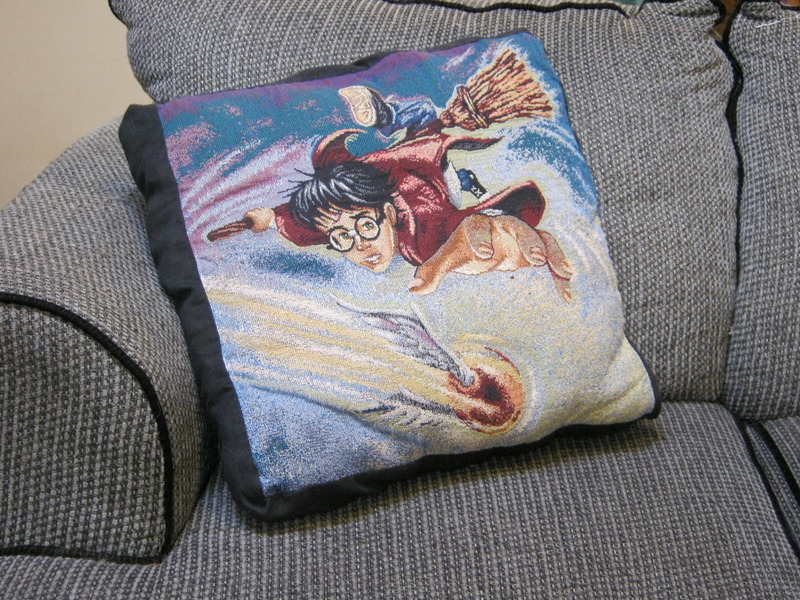 It's an exclusive and official Harry Potter and the Sorcerer's Stone pillow, one you can only order from those "fancy pants" magazines. It features a very young Harry Potter, right when his zany wizardy adventure was just starting. We acquired this in the heat of the first Harry Potter craze, nearly 14 years ago. This thing has history attatched to it, so there's certainly no way we were getting rid of it! The corners and edges were completely shredded. Holes where the print was poking through the back! The horror.. So, clearly I had to start from scratch when it came to the back of the pillow. 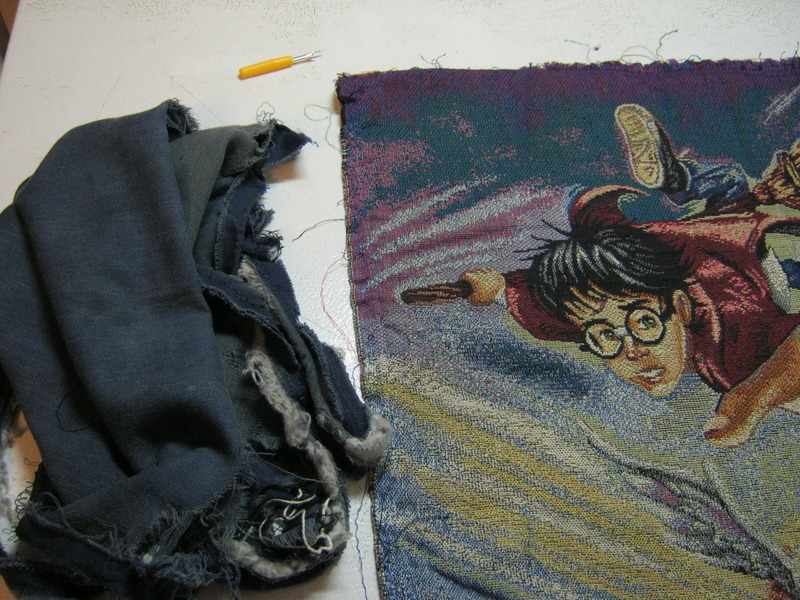 Fortunately, the gorgeously weaved Harry Potter print on the front was still in really great shape, so I didn't have to worry about repairing it. All I needed to do was separate the trashy back fabric from the print. I used my little tool called the Seam Ripper to do this. You could easily just use scissors and cut away the edging to your pillow, but carefully ripping out the thread seams improves the likelihood that your print wouldn't be damaged or cut off in any way. Admittedly, I am still somewhat a novice at sewing and only recently discovered the seam ripper. 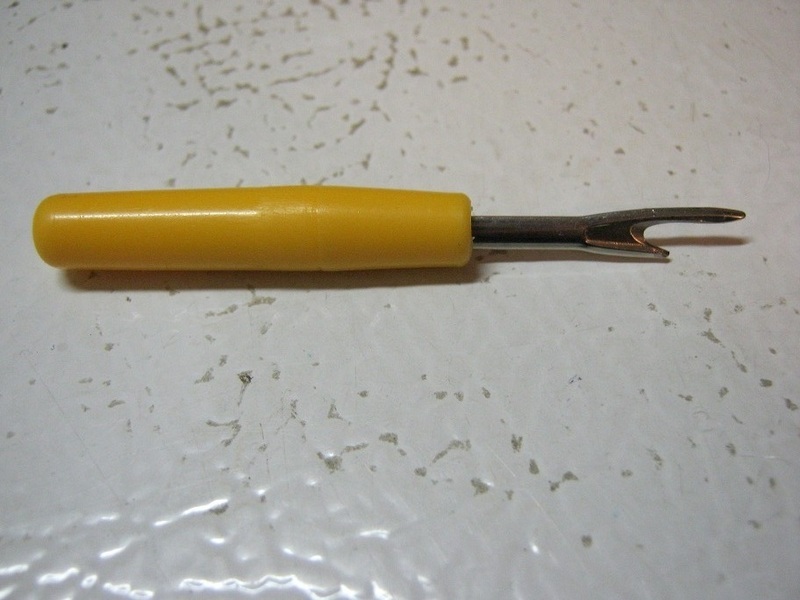 My trusty mini seam ripper. How did I ever possibly undo stitches without one before? Oh right, usually I just tried to rip out the unwanted stitches by hand, tore my project and had to start over. The seam ripper has saved me many of times now since I "discovered" it. It would've been especially useful when I first started machine sewing and was constantly having zany mishaps. If you're just starting out sewing, I definitely recommend keeping one of these near by. If you don't already have one lying around, you can get them from any craft store, wal-mart or even a decent dollar store. With my seam ripper, separating the pillow was a piece of cake. After that, it was simply a matter of selecting some new fabrics for the back and putting it together. That, and of course ironing. Personally, it isn't my favorite thing to do, but ironing out the wrinkles in your fabrics before you sew them onto your project will make a world of difference in the quality of your work. The iron is beneficial in many ways. For example, if you added any dyes or paint, it will permanently heat set it and make it washer machine friendly. Using an iron will also improve the neatness of your sewing. You can achieve nice flat and crisp seams and a professional finish to your work. Some of my projects require me to iron at least 3 or 4 different times to get the look I want... It's a pain, but it's totally worth it. Once ironing is complete, all you have to do is cut out the new fabric in the size you want and assemble your brand new pillow. All that technical stuff will have to wait for another blog post... In the mean time I'm assuming all of you already know how to sew together a pillow. I would strongly recommend using a sewing machine to do this kind of project. In fact, a project like this would be perfect for practicing your sewing machine skills if you're still a beginner. Sewing machines provide faster and stronger stitch work. A project like this, which would take hours to hand sew, took me only 45 minutes or so with the machine to completely finish the sewing process. If you don't know how to use a sewing machine yet, it's never too late to learn! It may seem like a daunting task but it isn't as hard to learn as you might think. It's a skill you can use for the rest of your life. Look out for that demonic beast!! As always, if you did this project for yourself, I want to see the results!